Apple Exec Phil Schiller Now Active On Twitter — And Instagram Too! Two years ago, Apple executive Phil Schiller apparently signed up for Twitter and started tweeting. But he didn’t tweet often, and few people followed him, probably assuming it was a fake account. But if Twitter’s verification process is to be believed, the account is real. 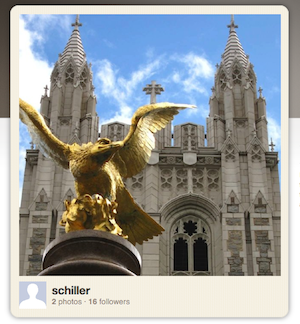 And further, Schiller has gotten a lot more active in recent weeks on the service. And he’s active on the hot photo sharing app Instagram too! What’s a bit odd about all of this is that Twitter had said they were suspending their account verification process while they came up with a better system. But Schiller just became verified, as 9 to 5 Mac noticed tonight. I’ve reached out to Twitter about it, but have yet to hear back. But I also reached out to Instagram when I noticed that a few of Schiller’s tweets this month were sending out Instagram pictures. Sure enough, it’s him, says co-founder Kevin Systrom. Here’s what else is odd about this: Apple has so far been reluctant to join up with the whole Twitter phenomenon. While plenty of employees use the service for private means, no high-profile figures at the company are — or at least not publicly or actively. Apple exec Eddie Cue also apparently has an account (which Schiller follows), but it’s protected. Meanwhile, we know exec Scott Forstall has one too, but he has never tweeted with it (and he only follows one person, Conan O’Brien). But Schiller, who is one of the most public figures at Apple, has a history of public outreach. You’ll recall that he was personally handling some of the developer backlash in August of 2009. At first Schiller was using his Twitter account sporadically to root on the Boston College Eagles, acknowledge on some Apple milestones, and lament the end of Battlestar Galactica (nice). But the past month he’s been sharing up a storm (for him), sending links to his pictures and tweeting out iTunes links with the new iTunes/Twitter integration. He has about 800 followers right now. Expect that to skyrocket. Meanwhile, this is a nice piece of publicity for the young Instagram service. Welcome, Phil! If an account is verified, it’s definitely fair to say it’s actually him/her.